In a move that comes as something of a shock, given that he survived the first cuts on Saturday, and that the team drafted him in the fourth round of the 2017 NFL Draft, the Colts have announced that they have released offensive tackle Zach Banner. 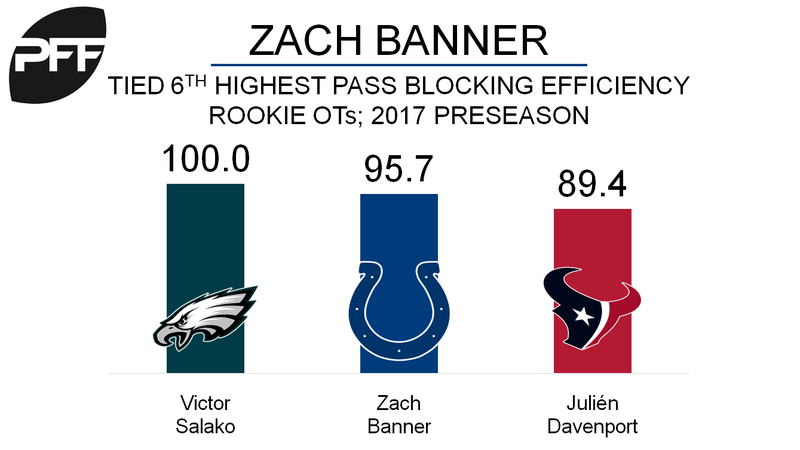 Banner had his struggles this preseason, grading out at just 58.4 over throughout August. Where he really struggled was as a run blocker, with his 37.0 run blocking grade ranking 188th out of 192 offensive tackles. If a team are going to pick him up, for the practice squad or active roster, it will be because of his pass blocking, where his grade of 76.2 ranked 14th throughout preseason. His pass blocking efficiency rating of 95.7, which measures pressure on a per snap basis with weighting towards sacks, was tied for 6th among rookie offensive tackles.